DOES QHB HAIR TANGLE OR SHEDS? We are committed to giving you beautiful hair with MINIMAL shedding and tangling. With proper care you can minimize shedding and tangling. Our hair will only get matted if you are not caring for it. YES, you may experience MINIMAL shedding. Please keep in mind that all of our hair extensions are a product of a manufacturing company. They are wefts together by a machine. You may limit shedding by sealing your weft with fabric fusion or fabric glue, however we do not guarantee no shedding. Please seal your wefts to protect your investment. Please refer to our Hair Care Tips. WHAT IS QHB SHIPPING AND RETURN POLICY? Shipping in USA is $7.99 and express shipping is $39.00. Orders take between 6-8 business days to arrive after payment is received. Express shipping will ship the next 1-2 business days. International Shipping is $24.99. International shipping (orders outside of USA) will take 10-12 business days depending on the country after payment is received. Please allow 1-2 business days for payments to process. You will receive a USPS tracking # on the third or fourth business day. We are an online store only, no pickups. All orders require signature confirmation, and is shipped via USPS Priority Mail®. Free shipping for orders $300 and up is for USA only. ALL SALES FINAL, we will EXCHANGE ONLY within 7 business days of receiving your product. NO REFUNDS, and NO EXCEPTIONS. But nevertheless, Do Not hesitate to contact us if you are not satisfied with your purchase. HOW DO I CARE FOR AND MAINTAIN MY VIRGIN HAIR? HOW MANY BUNDLES OF VIRGIN HAIR WILL I NEED? Each bundle is 3.5oz. For a full sew-in weave, the average person requires 3 bundles. Now, if you desire lots of volume and layers, you will need at least 4 bundles of hair. The hair is sold by weight not by length of weft. So for longer lengths, you will need 4 or more bundles. Use this chart as a guideline. Start with your shortest length. Queen Hair Bundles hair is measured true to length. The lengths on our website is the stretched length. Please e-mail us for longer lengths. CAN I CUSTOMIZE MY BUNDLE DEAL? We currently do not offer the option of customizing bundle deals. We offer 2, 3, and 4 bundles deals. If you require inches we do not offer in a bundle deal, you may order from our single individual bundles or form your own combination from the bundle deals we already have. CAN I COLOR MY VIRGIN HAIR? Yes, you may color the hair. Keep in mind that once the hair has been colored or dyed, it will no longer be considered virgin. Please seek professional Coloring Experts. Coloring your hair without proper procedure will damage your extensions. WHAT IS VIRGIN HAIR? WHAT IS QHB HAIR ABOUT? Virgin hair is 100% human hair that is in its purest state, healthy, raw, and unprocessed. Our virgin hair is unprocessed, un-dyed hair that comes from one donor. This means that it is never mixed with any synthetics, animal hair or other human hair. OUR HAIR GOES THROUGH A QUALITY INSPECTION BEFORE WE MAKE IT AVAILABLE TO CUSTOMERS. To qualify as virgin hair, it must meet rigorous standards including: not been permed, dyed, colored, bleached, or chemically processed in any way shape or form. This also means the hair is collected from a single donor with all cuticles aligned in the same direction from root to tip, to increase durability and prevent tangling. We at Queen Hair Bundles source out the best affordable 6A – AAAAAA virgin hair to sell to our clients from its country of origin. We started our company because we was tired of seeing our friends and family waste their money on low quality virgin hair. Our hair is premium quality, we do not sell cheap hair; we are selling you an investment. Our virgin hair is unprocessed, un-dyed hair that comes from one donor. We focus on selling bundles deals, so each bundle will have same donor. This means that it is never mixed with any synthetics, animal hair, or other human hair. Most of our hair is double drawn, which means the hair has even lengths. HOW DO I TEST QHB VIRGIN HAIR FOR AUTHENTICITY? – Human virgin hair will have the same odor as your real hair and will burn into ashes. -Fake virgin hair will smell very different from your real hair and will melt like plastic when burnt. – When washing hair if it does not return to original virgin texture the hair is fake. – Product free hair should not be stiff, but flows. – When you see vendors selling hair at cheap prices, the hair may not be authentic. Our hair will pass all these test. DO YOU SELL WHOLESALE HAIR? Yes, we welcome resellers to purchase wholesale for your business. Our virgin hair wholesale is your source for factory-direct access to premium wefted hair extension products. There is a minimum quantity purchase of 8 bundles for resell prices. Please CLICK HERE or contact us for prices. WHAT IS QHB HAIR COLOR NATURAL? We only offer hair in the natural dark brown color of undyed virgin hair. Natural color can ranged from off black #1B to dark brown #2. WHERE DO QHB PURCHASE THE VIRGIN HAIR? QHB Brazilian and Peruvian hair is purchased from small rural villages across South America. These particular villages have individuals that reside in rural cities that sell their hair for income. Our Malaysia hair is purchased from Southeast Asia. This is why we can guarantee authenticity of our hair. HOW IS QHB HAIR PROCESSED? Our hair is processed in a quality fashion. Before purchasing hair, we inspect and pick hair for quality control. Processing is done by hand in small batches and all of our hairs is sterilized and fumigated for lice, and nits. We make certain each bundle is from one individual. OUR HAIR GOES THROUGH A QUALITY INSPECTION BEFORE WE MAKE IT AVAILABLE TO CUSTOMERS. We shampoo and deep condition our hair before delivery. 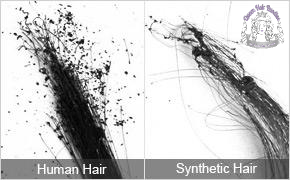 Some of our hairs are steam processed which gives a more defined pattern and luster. The steaming process is completely chemical free. WHAT IS THE DIFFERENCE BETWEEN THE ORIGINS? Our “Queen Brazilian Hair” is extremely luxurious, very soft, has lots of body, and natural shine. This hair is used diversely because of its softness, durability and density (thickness). The texture is easiest to blend with most ethnicities from some Caucasian textures to African American relaxed textures. Our Virgin Brazilian Hair is a versatile texture that can be worn straight, curled, or dyed. Our “Queen Malaysian Hair” is light, silky, and lustrous in texture. Completely 100% virgin unprocessed hair without any mix, comes from the country of origin. Curls will not loosen or drop with time and will maintain their form for the entire day. Blends best with straighten or relaxed hair. Malaysian hair is excessively shiny, but will lose its shiny luster over time. Our natural color Malaysian hair can be worn straight, curled or dyed.